“Give her the reward she has earned,” Eishet Chayil concludes, “let her deeds bring her praise in the gates.” We hope this book sings to you with a full heart, that you may experience the depth of appreciation this poem offers and ultimately make your Friday nights more meaningful. Send this book as a gift (click here): Show the women in your life how you value them by sending this book on Mother’s Day ­– or anytime of the year. Just because men will never ask for directions when they’re lost doesn’t mean that they are exempt from expressing their appreciation for what they’ve found. This format is for iPad, iPhone and iPod Touch. This format is for PDF readers such as the free Adobe Reader. This format is for Nook and desktop e-readers such as Calibre. Scroll down for information on how to transfer a .ePub file to your Nook. This format is for Kindle. Scroll down for information on how to transfer a .Mobi file to your Kindle. 1. Download the file to your computer and unzip it. 2. Plug your Nook into your computer’s USB drive. The Nook should appear as an external device. 3. Copy and paste (or drag and drop) the .ePub file from your computer into the “My Documents” folder on your Nook. 2. Plug your Kindle into your computer’s USB drive. The Kindle should appear as an external device. 3. Copy and paste (or drag and drop) the .Mobi file from your computer into the “Documents” folder on your Kindle. Hallmark is one way to say “I love you,” but this prayer – and the many layers of meaning it contains – has the potential to elevate Mother’s Day for any woman. 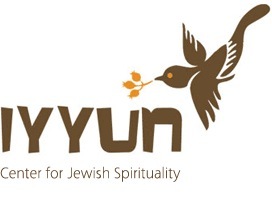 We encourage you to send this book to your mother, grandmother, sister, friend or any of the women in your life who would appreciate a thoughtful Jewish message on Mother’s Day. Send love, appreciation, and insight all in one. 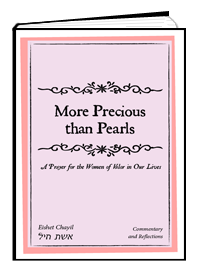 Fill out the fields below to e-mail More Precious Than Pearls as a Mother’s Day book and card. Click here to see what your Book Card will look like when it is sent.